The micro:bit is a great platform for learning how to build and program robots! 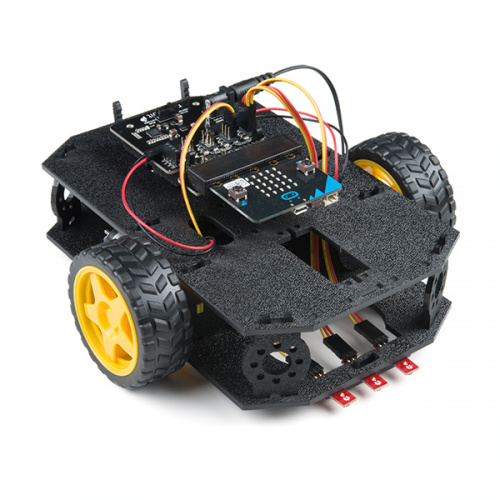 Combining the micro:bit with the SparkFun moto:bit carrier board creates a flexible, low-cost robotics platform for anyone from students getting started with the micro:bit to the engineer looking to quickly prototype or build a proof of concept. The micro:bot kit is the extension of that idea: build simple robots quickly that leverage the capabilities of the micro:bit while implementing peripheral sensors and motor functions with simple programming in the Microsoft MakeCode environment as a gateway into robotics. 1x SparkFun moto:bit - Carrier board multiple I/O pins capable of hooking up servos, sensors and other circuits. 1x Shadow Chassis - Our go to robotics chassis for tabletop robotics. 3x SparkFun Line Following Sensor - Three sensors for detecting lines and nearby objects. 2x Hobby Servo Motors - Program position with these motors. 2x Wheel — 65mm (Rubber Tire, Pair) - Wheels to attach to the Hobby Motors. 3x Jumper Wire — 3-pin, 6" - Wires to connect the line sensors to the moto:bit. 2x Hobby Gearmotor - Motors for driving the robots wheels. 1x 4xAA Battery Holder - Battery pack for powering the micro:bit and the motors. This guide is designed to get you started with the moto:bit board and the SparkFun micro:bot kit in a straight forward and simple way. We demonstrate each component's functionality and the corresponding code to make it work. While you explore this guide, we urge you to take your time and tinker with the sensors, code, and the ideas shared to build something tailored to your application and creativity. Our goal is to get you enough information and know-how to make you dangerous and then release you into the wild to do whatever you do with your robot. Be sure to share your projects with us over Twitter or Facebook! We are excited to see you Start Something! A quick introduction to accelerometers, how they work, and why they're used. All of our experiments and guides are licensed under the Creative Commons Attribution Share-Alike 4.0 Unported License. Feel free to remix and reuse our work. But please, share the love and give us attribution for our hard work!